It’s a cliché, sure, but you can’t miss it. 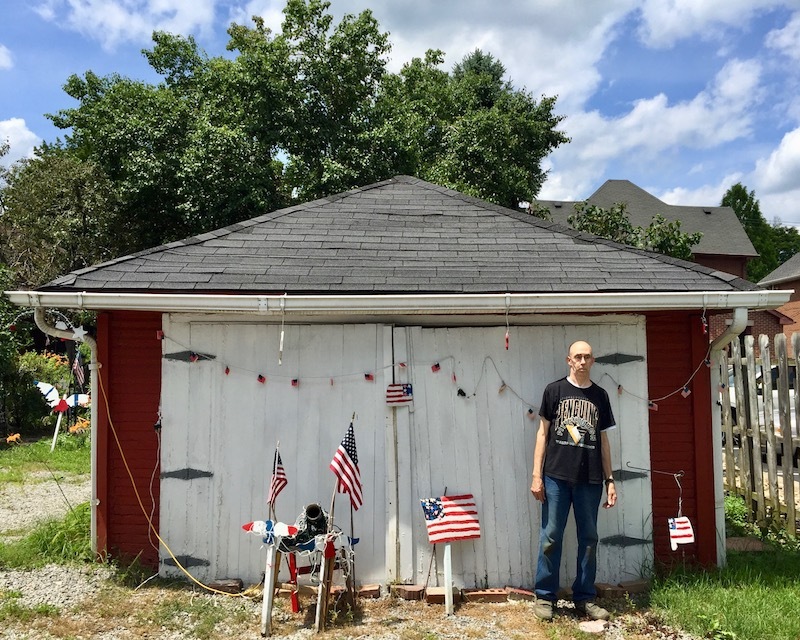 No, the sweet, pre-war two-story brick home would look a lot like many others found in Pittsburgh’s down-river boroughs but for the wealth–some might say overload–of red, white, and blue homemade patriotic holiday displays that fill every inch of its front, side, and rear yard space. 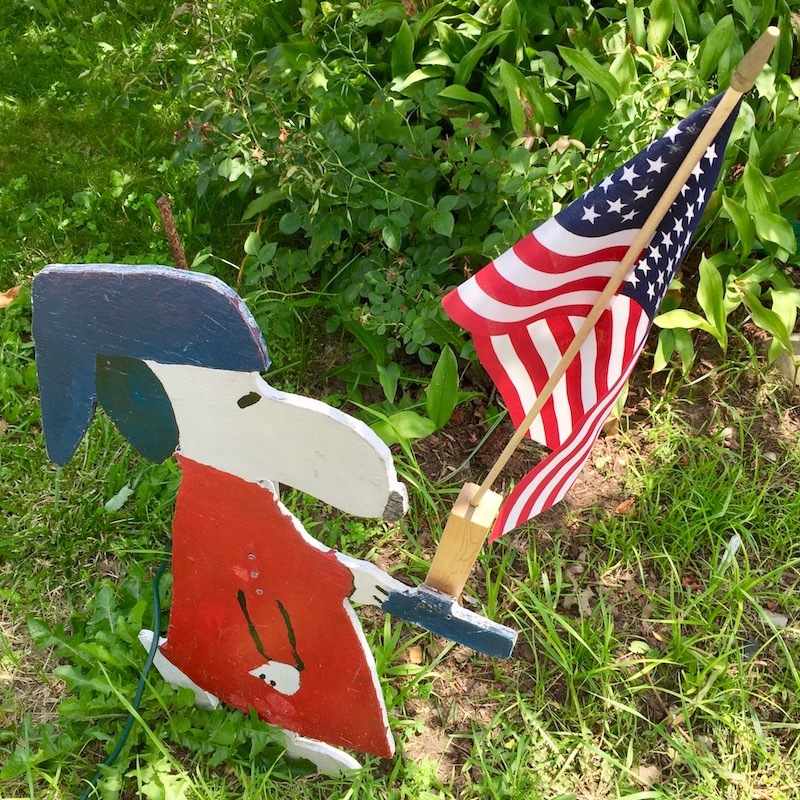 Together, they lift this house from small town charmer to an explosion of full-on Yankee Doodle Dandydom. Beaver, PA. A picture-perfect embodiment of quaint. 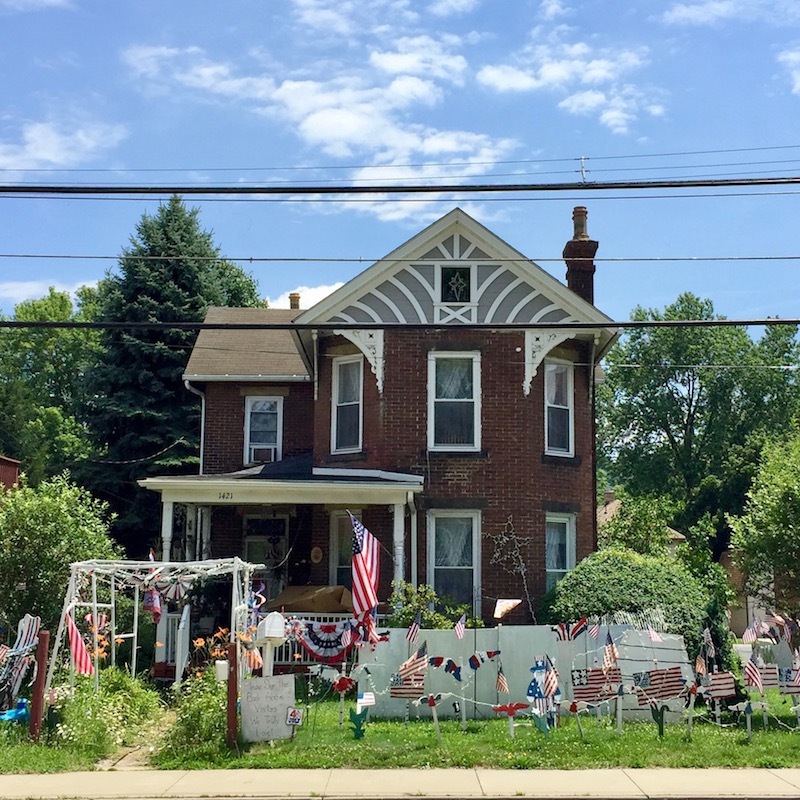 The town’s wide streets, stately manors, well-groomed lawns, and fancy boutiques look more country posh than the (ex-)industry brownfields and empty storefronts of almost all its Ohio Valley neighbors. But it’s a pleasant, accessible, middle-class midwestern posh, rather than its harder-to-take New England old money cousin. There was long bit about taking a bike from Monaca to Rochester and then here to Beaver, but our editor told us to cut the crap. Suffice to say, there are a bunch of interesting things in town and River Road is both aptly-named and bicycle-perfect. 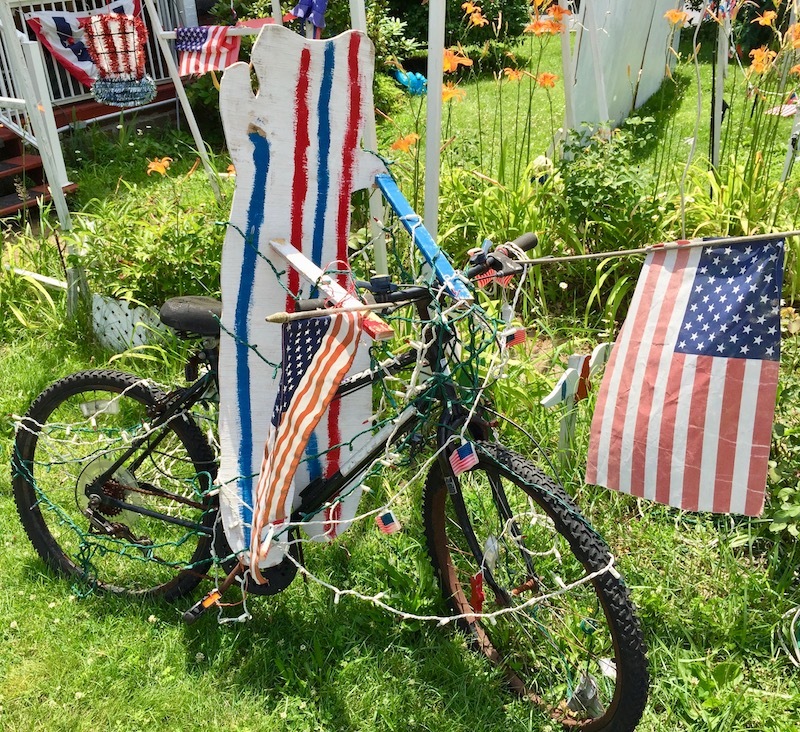 If you take it almost all the way around and then back to the main drag, your ride-around will conclude up on 3rd Street with the great homemade holiday decorations of Gary Thunberg. Some of the displays may be what you’re expecting. There are dozens of eagles, their wings spread in majestic mid-flight glory and bodies brightly marked like sports jerseys. A couple of them have been framed in lumpy ovals to appear as if in an official seal. 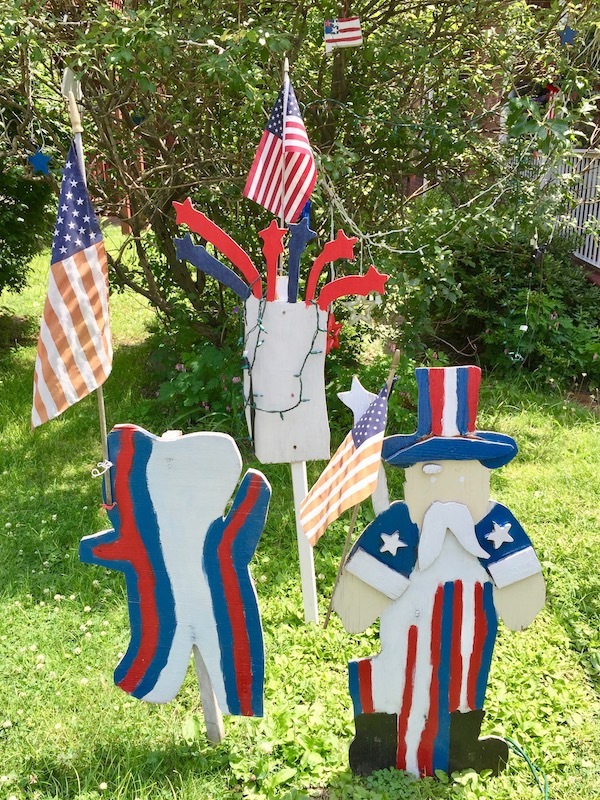 Uncle Sam is here–the red, white, and blue literally oozing out of him–as are many, many American flags in different sizes and variants. 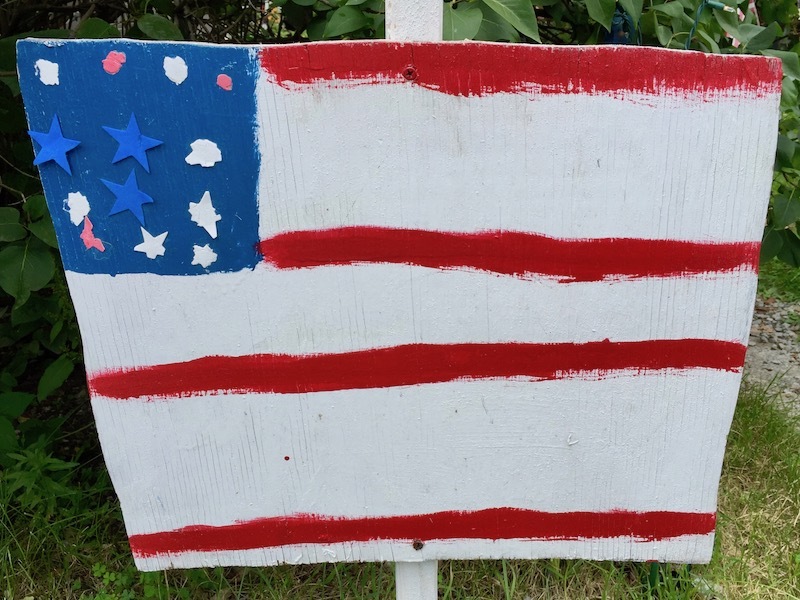 In The Orbit‘s annual Independence Day post, we mused about why it’s so difficult for homemade flag-painters to get the 50-star count right. On this matter, we need to eat some Corvus brachyrhynchos (that’s all-American crow). 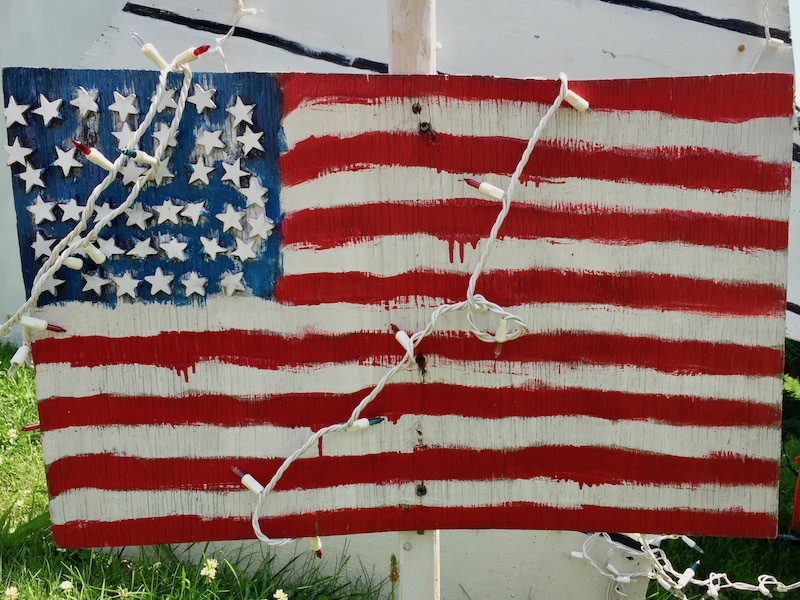 With so many homemade flags created by the same two hands, it’s exciting to see the umpteen different expressions that Gary Thunberg has come up with. 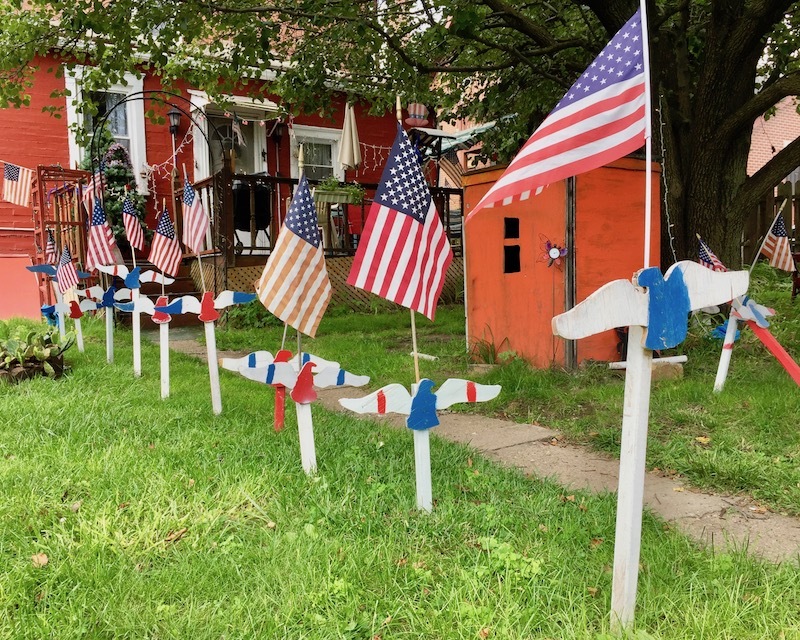 For sure: flags that are near the exact design you’ll see flying above the courthouse are featured in the yard. But so are seven-striped models of minimalism, gestural two-star tree-hangers, and reverse-color mind-benders. 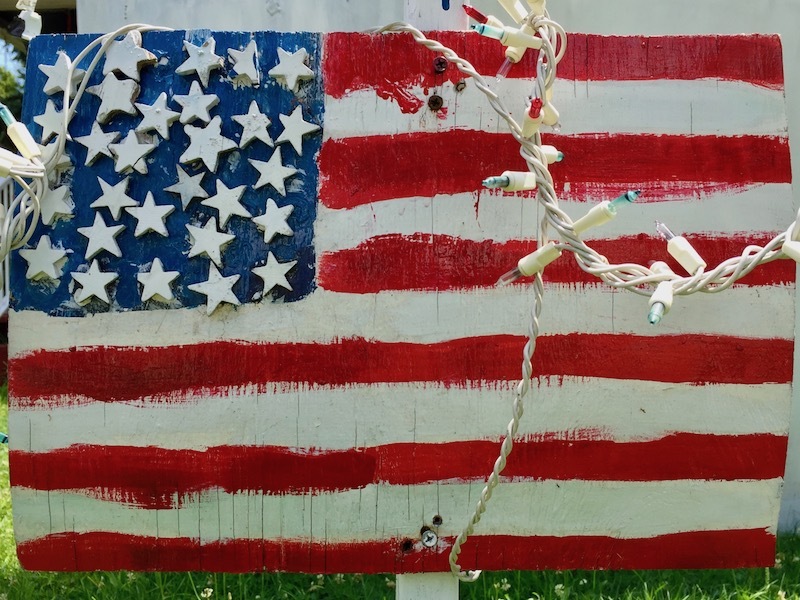 In addition to these familiar forms, the lawn display also includes some other interesting takes on America’s favorite color scheme. Thunberg attacks the most effervescent of holiday imagery in his captured-in-time fireworks explosions. These wooden cut-outs–complete with smoke trails and star blasts–are repeated several times with different paint jobs. The image is perhaps Thunberg’s most impressionistic form–a daring move to represent so much motion and light, sound and fury in two dimensions, staked in grass. The most unique of Thunberg’s choices has to be a large teddy bear form that appears multiple times around the property. How these relate to the declaration of independence, we don’t know–and didn’t think to ask at the time–but we’ll go with it. The bears are standing up for America with no identifiable facial markings and just the vertical red/white/blue stripes of the season. A human-sized teddy bear is out front riding a (real, decommissioned) bicycle. 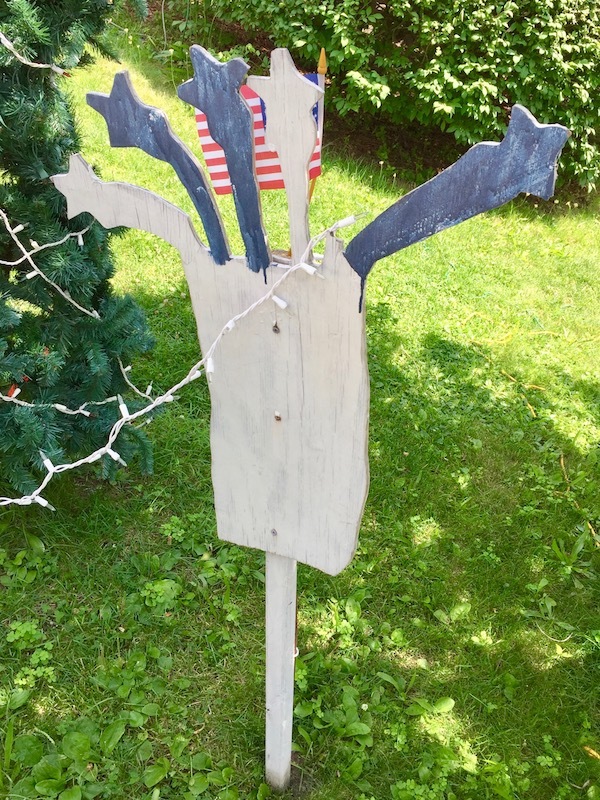 You’d think the 4th would be enough, but Gary Thunberg is holiday crazy. 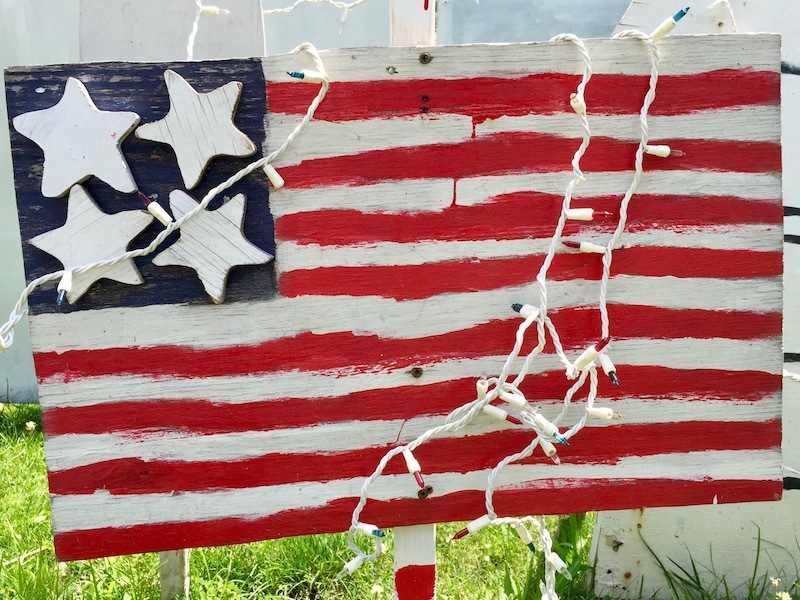 Independence Day is just one of four annual occasions that prompt the sixty-something year-old Thunberg to shuffle the contents of his storage shed/workshop/garage–taking in the previous event’s decor and prepping for the next. With a holiday every season [Halloween, Christmas, and Easter are the others] and the weeks of work it takes him to remove the old, bring out the new, patch, paint, and repair any trouble spots, and finally lay out and line up everything for display, the decorations are a (nearly) full-time side occupation. 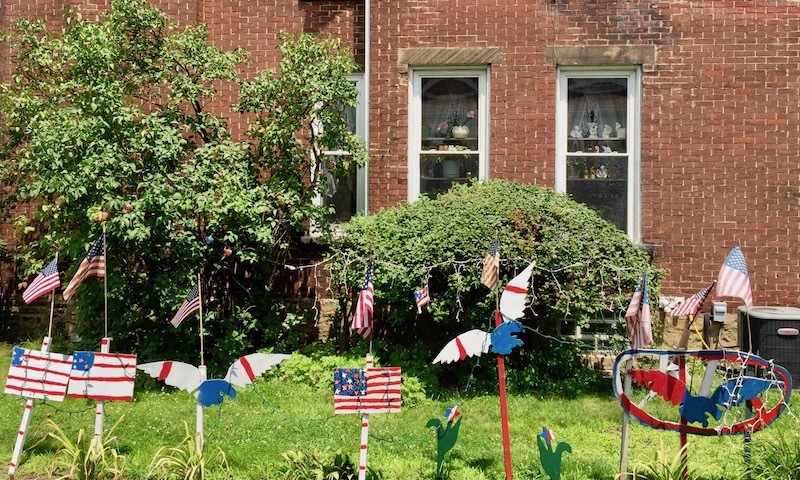 The family came to this house on 3rd Street over 40 years ago, and Gary’s passion for holiday decoration goes back almost as long. The painted plywood decorations are all cut out by Thunberg with a jigsaw using various paper patterns or templates. From here, they’re sanded, painted, and hammered into the ground. The majority of the display is saved, stored, and brought back out again each year, but Gary tries to add one or two new pieces each season. Neighbors have gotten into the act by donating lights, wood, paint, and brushes. The Thunbergs–Gary lives with his lovely 87-year-old mother Doris–want you to stop by and see Gary’s work. A guest book out front encourages visitors to sign in and leave their thoughts. Doris has volumes of past years’ entries with signees coming from every state in the country and all over the world. Catching this blogger photographing the side of his house, Gary came out to say hello and led me around, acting as tour guide to the full display, which extends into the back yard and out to the alley. Then I got invited into the house, phone numbers were exchanged, and we were invited back. We will be back–for sure. We’ll see you guys at Halloween, if not sooner. Yes, Sewickley is the other obvious exception. We weren’t sure what these shapes actually are, but Gary Thunberg confirmed them as teddy bears. So glad to hear you’re going back to cover the other holidays — that was going to be my comment/suggestion, if you didn’t mention it. Can’t wait! !